In this technique based class you will learn to make super accurate Flying geese using the Bloc Loc Ruler. Bring your fabrics and your machine for some fast and accurate geese. 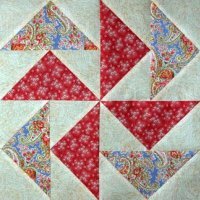 Use this block as a pillow, the beginning of a quilt, or some other fun idea. Bring two squares of background fabric (sky) each 9” square and two contrasting squares for the geese each 7.5” square. All classes are cash or check only. Sorry, no credit cards.